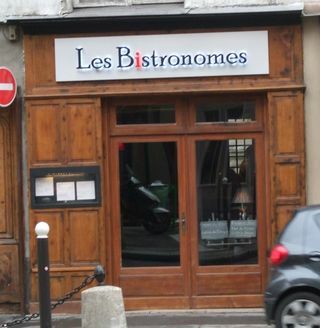 I can’t think of a better response to the naysayers who insist the food in Paris isn’t very good anymore – and there are lots of these people, since this particular skepticism is currently fashionable — than a meal at Les Bistronomes, a superb and stunningly professional new bistro on the rue Richelieu just across the street from the Moliere fountain. In short, this place is a class act, from the perfect timbre of the cordial welcome you get when you come through the door, to the good-looking dining room with a long cushy banquette running along one wall, white-painted beams overhead, and a window on to a now closed-to-the-public passage that used to take you from the rue de Richelieu right through to the Palais Royal (pity it’s off limits, since this would not only be a swell short cut, but a fleetingly coquettish experience of 18th century Paris). To be sure, the tables are rather too tightly spaced, but a young chef has to earn his keep and everything else here is nearly perfect, including the good lighting, antique mirrors on the walls, and the individual chalkboard with your name on it that sits on a railing behind your table. 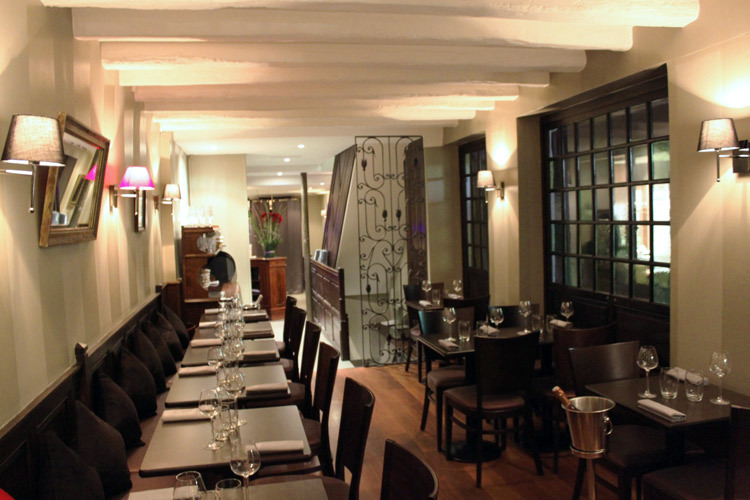 I travel a lot, and a restaurant this serious would be major news in most cities, whereas in Paris, it may have created a big buzz, but against the backdrop of many other similarly good recent openings. Meeting a friend for lunch the other day — Birdy, an American woman who grew up in Paris but now lives in New York — both of us were immediately impressed by this place. The little white ramekin of pork rillettes served with excellent bread were beautifully made rich, potently flavored, and just the sort of casual provocation necessary to make you look forward to the rest of the meal. Both of our starters were brilliant, and as graphically plated as anything you’d find in a restaurant costing three times as much as the 26 Euros for two courses or 35 Euros for three courses lunch menus here. Chef Cyril Aveline was most recently sous-chef to Eric Frechon at Le Bristol, and he brings an intensely well-drilled haute cuisine background to bear on the bistro register he’s chosen as the canvas for his first restaurant. My pate en croute with pickled baby vegetables was a deeply flavored slab of ground pork with a knob of foie gras and a chunk of rare duck breast in a beautifully made pastry crust, while Birdy’s Le Puy lentil salad was garnished with smoky slices of Morteau sausage and a nosegay of mesclun almost invisibly enlivened by a mustard-and-red-wine vinaigrette. “This guy’s great,” said Birdy after our first courses, and she was right. Her main course, an onglet (steak) with shallots came with an impeccably made gratin dauphinois, and if my two plump pieces of Dombes chicken were slightly overcooked, the cream sauce they came in was brightened by chopped fresh tarragon was delicious, as was the bed of Basmati rice. Perfectly ripened reblochon cheese and luscious rice pudding ended this terrific meal, and if it weren’t for the fact that this place gets considerably more expensive in the evening when there’s no prix-fixe menu, I know I’d be going here often in the days to come. my wife would go crazy!!!! !